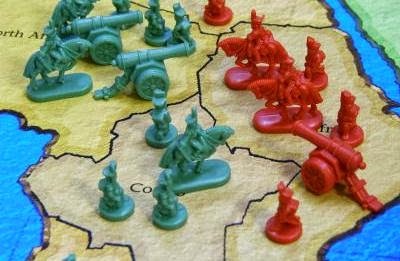 One of my very first posts was on the Game of Risk - Public Education Style. Well, with the Common Core the environment has changed quite a bit. Here is how things are going to go. First off, the game masters do not care if you like Monopoly, Battleship, Clue, or any other board games. The game masters do not care if you like UNO, Skip-o, Phase-Ten or any other card games. Throw them all out. The only game you're allowed to play is Risk. Each Common Core Risk game was hastily made. Each game will come with missing pieces. In fact, you will be just given a board at first. Players will be expected to create their own pieces. The game masters will send out pieces, not all of them, by the end of the first year. They don't care what your pieces look like or if you even have enough to play. In fact, during this time they don't even know what they want the pieces to look like. At the beginning of the second year the game masters will release some more pieces, but not all of them. Throughout this year, the rest of the pieces will be released whenever they feel like releasing them. All the meanwhile, players will be expected to be highly strategic, or at least strategic, even if the lack of pieces makes it difficult for them to develop their strategy. Oh, by the way, nothing is ever the game masters' fault. Players may find that some of the game pieces released by the game masters will be too big for some of the countries on the board to handle. The game masters don't care. The pieces were not designed for all countries and when playing with these pieces, those countries should be ignored. The game masters understand that the rules state no country should be left unconquered. However, the game masters will exempt you from this rule as long as you play by all the new rules. No single player can win a game. A game is considered finished when all countries have the same amount of game pieces on them. I know that this is a contradiction of what was said before and an impossibility, but the game masters have ignored this fact in the past and will continue to disregard it in the future. Have fun! Is there a Common Core Standard for curiosity?